The dogface puffer (Arothron nigropunctatus), also known by the name blackspot puffer, can present a number of challenges to the home aquarist. The handsome, entertaining dogface puffer requires a large tank to accommodate its size and specialized feeding requirements. Since the dogface puffer grows more than a foot long, it needs a large aquarium. A tank for this puffer should hold at least 75 gallons per puffer. The tank needs numerous large hiding places to help this fish feel safe. 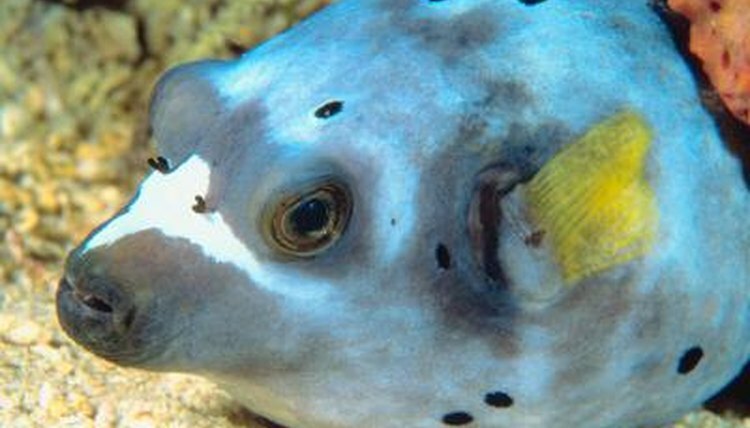 Puffers are generally tolerant of other puffers that are not more aggressive than themselves. The dogface puffer has a number of specific water conditions. It requires water with pH between 8.1 and 8.4. The specific gravity needs to be between 1.019 and 1.025. As a tropical species, the dogface puffer needs water with a temperature of 74 to 82 degrees Fahrenheit. The dogface puffer shares these requirements with many tropical saltwater fish. Additionally, the dogfish requires very clean water, so aquarium maintenance needs to be performed religiously. The dogface puffer has specific requirements of its tank mates. Other fish in the tank need to be large to avoid predation by the puffer, as the dogface may eat smaller fish. At the same time, aggressive fish may pick on the dogface. And the puffer may nip at larger long-finned fish. Meanwhile, no invertebrate is safe with the dogface puffer. This puffer loves to eat both stationary invertebrates like corals and more mobile ones like crabs and shrimp. Feeding can be a sticking point for this fish. The dogface puffer will eat most meaty foods like krill or silversides. However, he needs crunchy, hard-shelled invertebrates like coralline algae and stony corals to blunt his beak. The dogface puffer's beaks grow continually, and he needs hard invertebrates to chew on to keep the beak from overgrowing his mouth. Without hard invertebrates, this puffer's teeth may grow so large that the fish cannot use his mouth. In a healthy puffer, the teeth extend just beyond the lips. If they grow larger, you might need to have them trimmed. It's not easy to trim a puffer's beak, and you may need a veterinarian or a veteran fishkeeper to show you the ropes. In a smaller specimen, a cuticle cutter works, but a larger puffer, like a full-grown dogface puffer, might need a rotary tool. You will also need to get MS-222, a veterinary tranquilizer; dose very carefully; it can kill if you use to much. Once you've sedated the fish, have a friend hold the puffer while you cut off the tip of the beak. Work quickly, and get help if you're not sure. A cut on your puffer's lips can be life life-threatening.